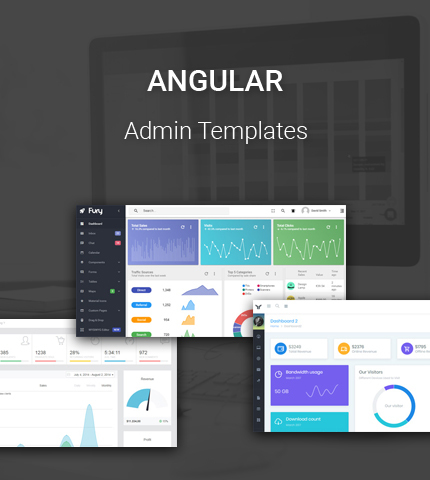 In today’s template collection we will be looking at some beautifully designed, premium Admin themes created with Angular. Angular (commonly referred to as “Angular 2+” or “Angular v2 and above”) is a TypeScript-based open-source web application framework led by the Angular Team at Google and by a community of individuals and corporations. Angular is a complete rewrite from the same team that built AngularJS. As usual, the admin templates below come with many features, plugins and ready to use components. Also, many of them are made with Bootstrap. Let’s begin! * Note: This article contains affiliate links which means that if you click on these links and buy the template, I might get a commission. Sing App by Flatlogic is an admin template in a unique and stylish design, which comes packed with numerous features to make everything easier for you. It is a mobile-first dashboard template, with a specially designed touch interface and with an incredibly fast loading time. There are two Sidebar options: Static and Revolutionary, which only shows up when you need it, by hovering over it. The codebase is neatly organized and fully commented, making it developer-friendly and easy to work with. It comes with the Widgster plugin, which you can use to easily place and control widgets on your new website. There is a ready-to-use Inbox Application (you need to code the backend), to keep in touch with any mail coming your way. There are different Chart styles, which can be used to keep track of different aspects of your page, such as Visitor stats. Rickshaw is another beautiful chart feature, that gives real-time information on the stats you are monitoring for the site. There are two Menu levels and other useful features such as Maps, Tables, Gallery, Invoice, Login page etc. It is a fully responsive template, as well as compatible with all modern browsers. MaterialPro is a developer-friendly open source template for admin dashboards. It is designed by Wrappixel, with RTL support and it is also fully responsive. Upon download, there are 6 different demos to help you set everything up quickly. This is especially useful for beginners. It comes with over 5 different dashboards and a Megamenu. For text and posting there is Summernote and for media there is Lightbox, for a beautiful display of any images and videos uploaded on the website. There are over 3000 Fonts Icons and more than 700 different pages, for creating a truly unique and outstanding site. For keeping in touch with visitors and customers there is the Chat Application and there are also numerous Inbox and Mail options, as well as Contact forms. UI Elements are abundant and very useful, as is the Range Slider. You will find PSD files included and lots of ready-to-use plugins. Light Blue is another admin template by Flatlogic and it comes in an innovative design with 3 Color Schemes: Transparent dark, Transparent light and White opaque. There are 3 Sidebar Options and it is a Developer-friendly template, with a code that is easy to read and work with. There is cross-browser support and it comes in a fully responsive layout, on all devices. There are several different Chart designs and Rickshaw is also integrated. The widgets are quite easy to customize and you can choose from 6 different background styles and 4 sizes. One of the best features is Bower package manager and also GruntJS, to help with repetitive and automated tasks. This is very useful for those of you looking to work on the code as it will save a lot of time. There are also two table options: Static and Dynamic, as well as numerous Pages, such as Login, Invoice and Landing Page. Primer by Iamnyasha is a material design admin template made with Angular 2, which comes with Ahead-of-Time (AoT) compilation and Lazy loading support. It is Fully responsive on all devices and it is Translation-ready in several languages. This will help with visitors from countries who are not English speakers. It comes with several different Forms and Datatable options, along with a very handy Task list. This includes sections such as Backlog, ToDo, Complete and In Process, to help keep you on top of things. Primer is also e-Commerce ready for those looking to run an online store. And lastly, there are 5 Apps included: calendar, Media, Messages, Social and Chat for managing different aspects of your website, as well as for keeping in contact with visitors, customers and subscribers. REAL by Creativelabs is an admin template, which comes in seven Bootstrap 3 and 4 versions, including AngularJS. It comes packed with many features. There are numerous Widgets for monitoring different aspects of your website, such as Income, Social Media, Revenue, Visitors, Tasks. You can place different Buttons and create Cards, customize Forms to suit your needs (Credit Card, Subscription, etc.) and make use of Charts choosing your favorite design. There several Pages and Plugins (Calendar, Notifications, Sliders and Tables) to make things practical and less time-consuming. The Dashboard comes in an All-in-One view, giving you a complete overview of everything that’s going on. Created by Arousing, Material admin is a simple and clean template, which comes in Light & Dark themes. There are 18 color schemes to choose from and the design is Fully Responsive. The UI Kit comes with a lot of components and there are multiple layouts to choose from. Not just that, but you can also create your own. You will find over 1500 Icons (Material and Font Awesome), as well as a clean code to work with. It comes with Lazy Loading support and also Cross Browser and High Resolution support. This is an e-Commerce ready template and it comes with 7 main Pages, as well as some additional Extra Pages, such as Login, Lock Screen, etc. Also created by Creativelabs, SimpliQ is an admin template with plenty of plugins. These include Animate, Breadcrumb, Charts, Toastr, Calendar, Sliders, Datatables and many more. It comes with Font Awesome Icons, as well as Glyphicons and Simple Line Icons. You can choose from different styles, as well as different Buttons and Social buttons. There are options for creating Cards and Forms. The widgets are numerous and they help keep track of different parts of your website or application, such as Visitors, Customers and Sales. The UI kits include Invoicing and Email and the Dashboard gives a very detailed overview of Traffic and Activity. Fury is a very developer-friendly template by Visurel. It is lightweight and incredibly fast, in a clean design. There are more than 300 Material Icons by Google and Snack Bar notifications. There is Advanced Google Maps integration and the charts are fully customizable, as are the Widgets in the Dashboard. Since we are on the Dashboard, it is clean, very organized and comes with Dynamic Navigation and a hover Sidebar for a more practical use. There is a Chat option and an Inbox option. Other great features are the Drag & Drop and the Multi Level Menu.